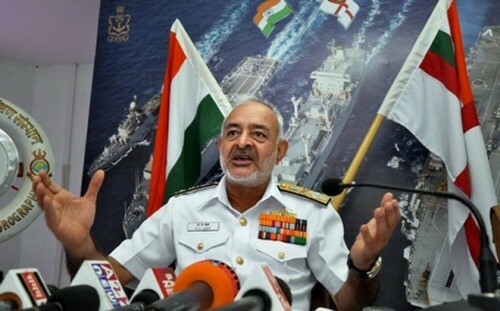 New Delhi, March 5 (IANS) Observing that India is facing state-sponsored terrorism, Navy chief Admiral Sunil Lanba on Tuesday warned about terrorists being trained to carry out attacks even via sea route. Addressing the Indo-Pacific Regional Dialogue, Admiral Lanba without taking names hit out at Pakistan for abetting terrorists, who carried out the February 14 Pulwama attack in Jammu and Kashmir that killed 40 CRPF troopers. "India, however, faces a far more serious version of terrorism -- state-sponsored terrorism. You have all witnessed the horrific scale of the extremist attack in the Indian state of Jammu and Kashmir just three weeks ago," he said. "We have seen how quickly terrorist groups evolve across the globe and this particular 'brand' of terror may well become a global problem in the near future. "The Indian security establishment is continuously working to address this menace. It is imperative that the global community acts to contain and eliminate terrorism, in all its forms," he added.